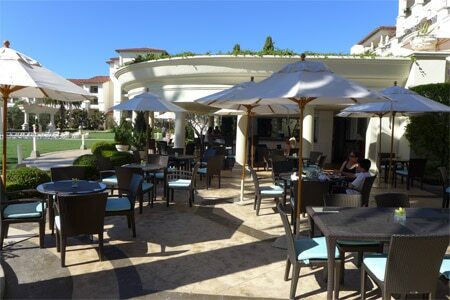 Outdoor bar and restaurant with lovely architecture, a commanding ocean view and pleasing California fare. : On sunny afternoons when this summer-only bar and eatery is open, upscale vacation-goers sit back and relax in the shade of this resort’s palatial white Italian architecture. The bar is a good place to watch the day's game while sipping a brew and noshing on coconut shrimp, steak nachos or a surprisingly good duo of ahi. The entrées here, too, are above average for such a casual resort spot, so order a healthful and flavorful grilled vegetable focaccia sandwich or the opakapaka sandwich (tempura shrimp and vegetables served open-face on ciabatta bread with wasabi aïoli). This restaurant also serves guests poolside, so take advantage of the extensive kids' menu if you have your little ones in tow.